I did some pretty aggressive testing yesterday. This release, which will be one of the last feature releases, adds some fun, new elements to the "World" menu and the Settlement Event Log. In addition to the normal corrections and fixes, this 1.32.444 also improves genealogy/lineage calculation and usability a bit. 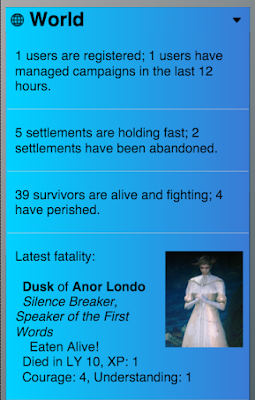 This release further optimizes both the Campaign Summary view and the Settlement Sheet while continuing to distinguish them from one another: the Campaign Summary view now shows Endeavors in addition to other settlement buffs, while those elements have been removed from the Settlement Sheet. Meanwhile, the Settlement Sheet now has controls for the bulk addition of new survivors (i.e. the "First Day" Settlement Event just got a lot about a million percent less tedious). This release (finally) adds user preferences to the main asset models and overhauls the Settlement Sheet's logic and back-end calculations. As part of the release/finalization of the Manager, I'm going to throw together a few tutorial/demo videos to show screens and general usage: I just uploaded the first one. This tiny release is focused on getting the webapp ready for launch/release and doesn't include much in the way of features: I spent most of my development time today working on the documentation and the tutorial videos. This release overhauls the Settlement Timeline and implements it as a proper feature with methods and extensibility and the whole schmear. I've got a few more things to add to the Timeline and they will be out in tomorrow's release. Survivor Images Now Appear in the "World" Menu! A dead survivor in the "World" menu (wide resolution). A dead survivor in the "World" menu (mobile resolution). 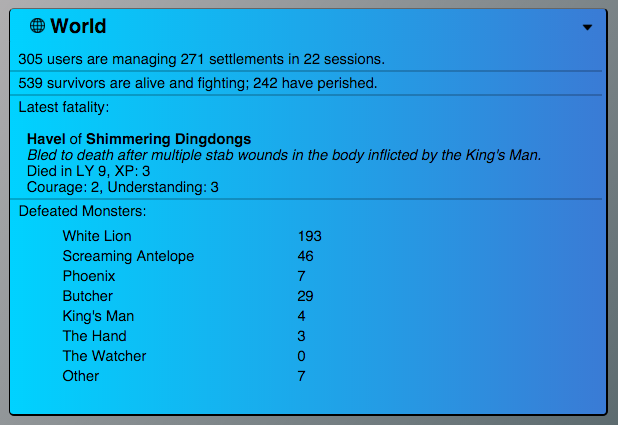 In addition to survivor epithets and cause of death (both optional), dead survivor's names, stats and "avatar" images now appear on the "World" menu when the survivor is the most recent survivor to perish. As usual, this "day after" release focuses on addressing issues introduced in yesterday's major feature release and cleaning up the back end (i.e. paying down technical debt). Feature-wise, the only major enhancements involve survivor avatars, which are now sown on the Dashboard's "World" menu and included in user data exports. As of this release, the only work left to complete on V1 has to do with the settlement Timeline and I should have that wrapped up early this coming week. 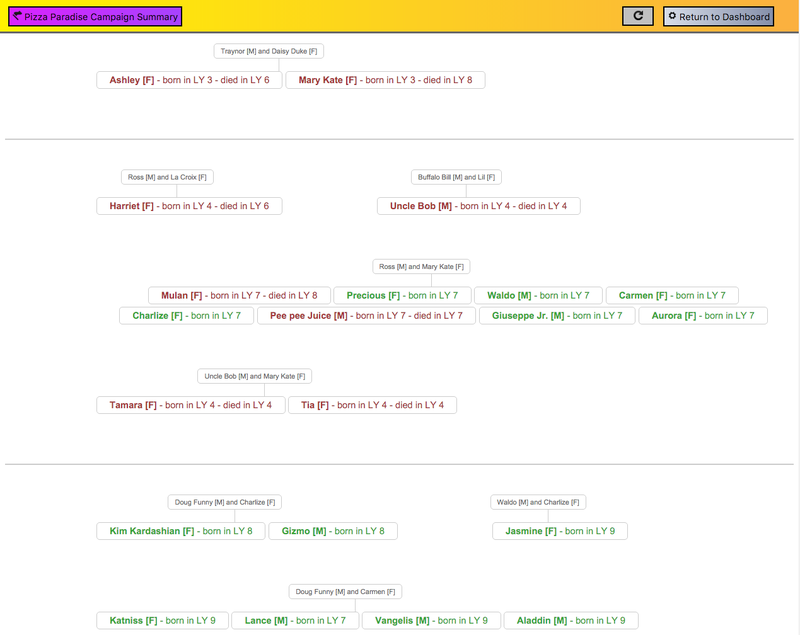 Survivor Lineage Charts are here! 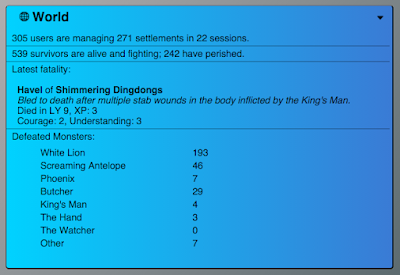 Access survivor ancestor and Intimacy records from the Settlement Event Log! 1.31.383 implements a brand new feature and is concurrent with a significant milestone and an important announcement: see below the jump break for important info that does not have to do with the release details. Release 1.31.383 overhauls survivor data model normalization and automatically corrects a lot of legacy data model issues. 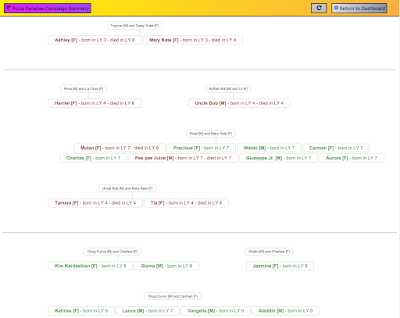 It also adds settlement lineages and family trees to the Settlement Event view. There are a host of bug and presentation fixes included as well, so this one's a pretty big deal. The final few V1 feature releases should be smaller in scope and take less time to deliver. What follows is not your typical, "hey guys, look at my awesome painting skills" post about building and painting minis. Rather, what you will see below is what happens when a Kingdom Death Monster mini gets basically destroyed and a guy rebuilds it from scrap resin and green stuff. I have not so far used this blog for posts about minis and game stuff and I do not plan to change or complicate the focus in the future, but I wanted to share some shots of a project I've been working on lately and this seemed like a logical/easy place to do so. In addition to the usual bug fixes for the previous release, this release implements new functionality related to the Twilight Sword as well as the ability to mark a settlement abandoned. As usual, I spent some time dogfooding/soul-searching the app and re-evaluating the backlog after Saturday's big feature push. The result is today's release, which pushes a handful of usability and bookkeeping improvements as well as some back-end enhancements related to the final 10 features that need go out before the app is "feature complete". This is a big one. Release 1.29.347 fixes a handful of presentation bugs introduced yesterday when password resets were added. This release also implements the Settlement Event Log: the SE Log is read-only and can be accessed by anyone playing in a campaign (from the Campaign Summary view). For now, only a handful of events are logged, but I intend to add more SE logging as I go. This release implements password recovery via email and adds the logo art to the wide-resolution sign-in screen. This release fixes some minor presentation issues, pays down a bunch of the technical debt surrounding defeated monsters and adds a couple of small features. This release is focused on backend fixes and improvements regarding permissions and survivor sharing and management and addresses a number of issues that percolated up during last night's play-testing. This release pushes an overhaul of the Survivor Sheet's hit boxes as well as a handful of QoL and usability updates based on a long weekend of QA and testing with a bunch of awesome dudes. Today's release adds the ability to append survivor images (avatars) to survivors when creating a new survivor or when editing the Survivor Sheet! The avatar images appear on the Survivor Sheet as well as the Campaign Summary view. This release implements survivor images: individual survivors may now be associated with a user-specified image that will show up on the Survivor Sheet and elsewhere (for quick visual reference). Pretty good, guys: pretty good. This releases pushes a re-design of the navigation buttons for mobile resolution and introduces the Kill Board to the "World" menu. I also spent some time with the backlog on Wednesday (my usual routine on the day after a big feature goes into Production) and closing the major usability gaps now seems like something that could reasonably happen in the next week or two: once all of the usability issues are addressed, I plan to get back to work on non-essential features. I don't want to Jinx it, but my current target for being "feature complete" is now looking like early February. This release implements Excel exports from the Campaign Summary view and nothing else. Check it out and let me know what you think (I definitely consider this a "first draft"). If anyone has any ideas about spreadsheets you would like to see emulated here, pass them along and I will attempt to implement them in the Manager (no promises). This release features mostly backend improvements. Most notably, export and import admin is fully functional and I am planning on pushing XLS campaign exports in the next Release. As far as UI/UX goes, a handful of Survivor death issues are resolved, a couple of "convenience" features are added to the Settlement sheet and that's about it. This is the first release since the massive DDOS attack on Linode and related outages that started on New Year's Day 2016 (and which are presently ongoing). I have some additional comments and updates on that situation after the jump break. As far as the release goes, there are some fixes and corrections in this one, but mostly this release fancies up the UI/UX piece on the Survivor management controls in the Campaign View and on the Settlement sheet. New/newborn buffs from Principles and Innovations are automatically applied on new Survivor creation (finally). ...and we're back. For now. Looks like the outage is over: about an hour and a half ago, the Linode status blog (http://status.linode.com) announced that the upstream provider was going to start gradually restoring access to their Atlanta datacenter (and that includes us). As many of you have noticed, http://kdm-manager.com is presently unavailable. Long story short, the company that hosts the VPS where the application lives has been under a several-days long DDOS attack. A few hours ago, a Linode engineer posted a summary of the attack so far, with a short commentary on what's going on behind the scenes to mitigate it. In the meantime, I will be looking at redundancy strategies involving other providers, but for now, there isn't much to do but sit and wait it out.